Alberto Casado graduated from the San Alejandro School of Fine Arts (1989) and the Superior Institute of Art (1996), both in Havana. In 1997 he was an artist-in-residence at the Vinalhaven Graphic Arts Foundation in Vinalhaven, Maine. 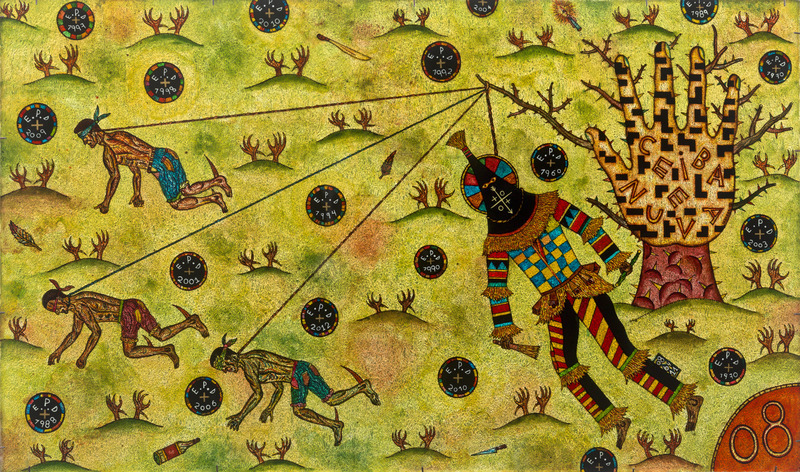 Some of his most notable solo exhibitions include Hidden Realities (with Rocio García) at Baruch College’s Sidney Mishkin Gallery in New York, NY, 2011; Todo clandestino, todo popular (All Clandestine, All Popular) at Art in General in New York NY, 2005; Historias del Barrio (Stories from the Neighborhood), Espacio Aglutinador Gallery in Havana, 1996. His works have been included in several group exhibitions such as Combination No. 2 at the 8th International Biennial in Istambul, Turkey, 2003; Common Sense at Habana Gallery in Havana, 2003; Dangerous Yuma at Espacio Aglutinador Gallery in Havana, 1999; Más allá de las apariencias (Beyond Appearances) at Berini Gallery in Barcelona, Spain, 1995; No valen guayabas verdes (Green Guavas No Good) at the Superior Institute of Art in Havana, 1994; and Las metáforas del templo (Metaphors of the Temple) at the Center for the Development of Visual Arts in Havana, 1993. Celular Fhone, 2009. Aluminum foil, paint and serigraphic ink on glass, 28 1/2 x 27 in. Homenaje a David Hockney (Homage to David Hockney), 2009. Aluminum foil, paint and serigraphic ink on glass. 15 x 11 in. En "El objeto esculturado" (At "The Sculptured Object"), 1998. Aluminum foil, paint and serigraphic ink on glass. 20 1/8 x 34 3/4 in. No más (Mo More), 2010. Aluminum foil, paint and serigraphic ink on glass. 12 3/8 x 12 3/4 in. Oasis, 2001. Aluminum foil, paint and serigraphic ink on glass. 26 3/4 x 17 1/2 in. Ceiba nueva (New Ceiba), 2009-2013. Aluminum foil, paint and serigraphic ink on glass. 16 1/4 x 27 7/8 in. Gato tigre (Cat Tiger), 2011. Aluminum foil, paint and serigraphic ink on glass. 11 5/8 x 27 1/4 in. Untitled, 2014. Aluminum foil, paint and serigraphic ink on glass. 19 1/4 x 18 5/8 in. SOS Peashooter, 2014. Aluminum foil, paint and serigraphic ink on glass. 18 3/4 x 18 1/4 in. Y si cago no como (And If I Poop, I Don't Eat), 2012. Aluminum foil, paint and serigraphic ink on glass. 17 1/8 x 12 3/8 in.